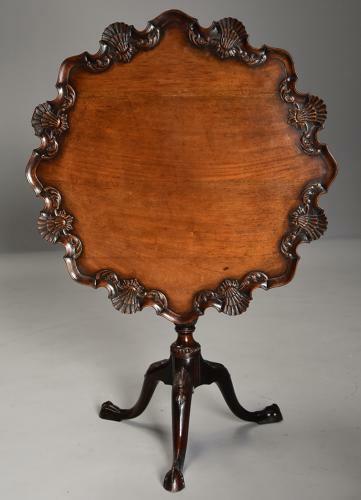 This table consists of a mahogany top of good patina (colour) with applied scallop shell and foliate carved decoration with applied piecrust decoration to the edge, the top can either be secured down or tilted up. The top is supported by a tri-form base consisting of a turned and carved baluster column with foliate and rope twist decoration leading down to three cabriole legs with scallop shell carving to the knee and terminating with claw feet. This table is in excellent condition for age, is of stable construction and can go straight into a home, it is a very versatile table and could be used in a variety of settings.